Both finance companies and banks are promoting consumer lending to capitalise on high demands ahead of the country’s largest holiday Lunar New Year (Tet). The Tien Phong Joint Stock Commercial Bank (TPBank) has just launched a ‘super speed’ auto loan program, with a commitment to approve loan appraisals within eight hours. Customers can borrow up to 80 percent of the value of a car over 84 months. The Vietnam Technological and Commercial Joint Stock Bank (Techcombank) is applying an unsecured loan programme, requiring no collateral or deposits. Under the program, borrowers can get loans at a maximum amount of 10 times of their monthly income, but not exceeding 300 million VND (12,880 USD). Foreign banks, such as Shinhan Bank and Standard Chartered Vietnam are also boosting consumer lending. At Shinhan Bank, customers can get loans of 10-12 times of their salary over 36 months, providing their salaries are paid into the bank. The RoK bank is offering interests rate of 19-23 percent per year. Standard Chartered Bank Vietnam is offering loans of up to 900 million VND over 12-60 months. To qualify for loans, borrowers must have a monthly minimum after-tax income of at least 10 million VND. Finance company HD Saison is also offering loans for customers to buy motorbikes before Tet. 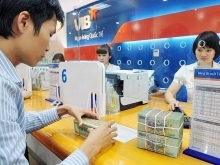 According to the National Financial Supervisory Commission, Vietnam’s consumer lending had recorded strong growth in recent years, from 50.2 percent in 2016 to 65 percent in 2017. The ratio of consumer loans out of the country’s total outstanding loans also increased from 12.3 percent in 2016 to 18 percent in 2017. The numbers for 2018 have yet to be released, but Nguyen Mai Long, CEO of EVN Finance’s Easy Credit, said consumer lending still contributed a significant proportion to the banks’ profits. Long forecast demands for consumer finance would remain high in 2019, given efforts to stimulate consumption among both producers and consumer finance lenders amid rising incomes. Long estimated consumer finance companies had opportunities to provide loans for potential customers, who account for about 48 percent of Vietnam’s 95 million population.